Sony XDCAM EX camera Rolls are on a drive in BPAV folders. Inside each BPAV folder is a CLPR folder and an empty folder called TAKR. The CLPR folder contains the clips, including MP4, .SMI, .PPN, .XML, .BIM. If you only have the BPAV’s, then you’ll have to name all the clips and take a considerable amount of time re-linking eveything back up. So users often creat MOV from BPAV files. Many guys choose to capture and transfer BPAV to MOV or XDCam EX files for FCP editing. Using Log & Transfer straight from the memory card, you may fail to capture footage from BPAV folder for “BPAV” contains unsupported media, (such as XML) or has an invalid directory structure. Some people use XDCAM Transfer, but error often happens. To be able to import or edit XDCAM EX BPAV files with Final Cut Pro X/7/6 on Mac smoothly, we would recommend UFUWare HD Video Converter for Mac, which is able to add “BPAV folder” to keep EX stucture and automatically select MP4 footage from BPAV files and covert them to MOV at batch mode. The easy-to-use and powerful BPAV file to MOV Transfer software program can also capture multiple BPAV folders via adding the parent folder. Then you can convert BPAV media files to ProRes MOV FCP can easily re-link to them. 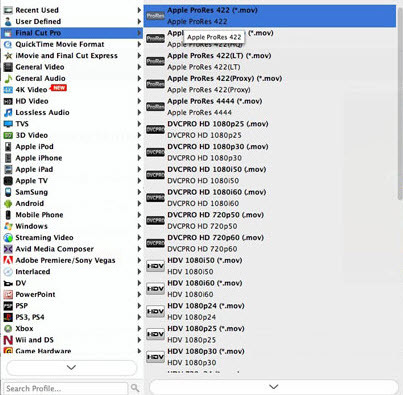 Apart from ProRes, you can also directly convert BPAV files to QuickTime MOV, DNxHD, AIC, etc. Read on to find a step-by-step guide talking about how to convert BPAV files to Apple ProRes (*.mov) for editing on Mac with Final Cut Pro X/7/6 without a hassle. Step 1: Install the BPAV to Final Cut Pro converter program on Mac and run it. Drag the .mp4 clips within BPAV to the software. Or you can also click “Add” button on the top of the main interface to import video to the program. Step 2: Go to “Format” bar and choose “Final Cut Pro > Apple ProRes 422 (*.mov)” as output format for Final Cut Pro X or FCP 7/6. Click the “Settings” button and customize proper video/audio parameters including Video size, bitrate and fame rate and more. Step 3: Click “Convert” to start transcoding BPAV files to ProRes for FCP X/7/6. After conversion, you can play or edit BPAV clips in Final Cut Pro without losing any quality in a flawless way. How to encode BPAV MP4 files for DaVinci Resolve editing?